The Minneapolis Institute of Arts boasts one of the top three collections of Prairie School objects in the United States. It has been built mainly over the past twenty years through purchases and generous gifts. The museumâ€™s outstanding collection includes furniture, architectural fragments, art-glass windows, and a rare example of Prairie School silver. 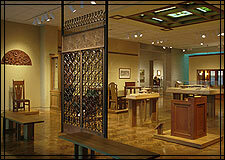 In 1998, the Institute completed the Ulrich Architecture and Design Gallery to house the majority of the collection. The Ulrich Galleryâ€™s warm color and wood trim form an ideal backdrop for objects including Frank Lloyd Wrightâ€™s hallway from the Francis Little House and a large art-glass skylight from the Madison State Bank by Purcell and Elmslie. This section allows the user to browse through objects grouped by architect-designers featured in the museumâ€™s collection. A fifth group includes Arts and Crafts pieces made or designed in the Midwest. Select a group of objects below.